This post is written by me on behalf of Tyson Foods, Inc. This shop has been compensated by Acorn Influence, Inc. and its advertiser. All opinions are those of TipBuzz. 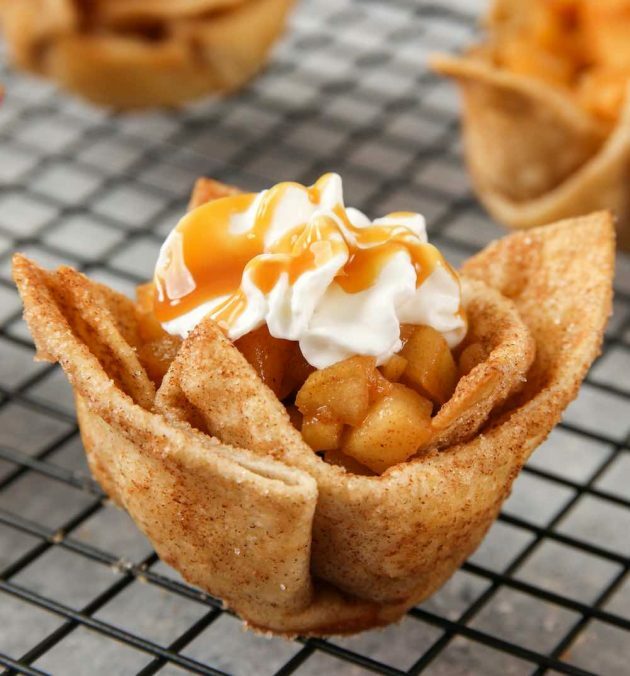 These Apple Pie Tortilla Cups are a delicious and easy dessert that only takes 15 minutes and 5 ingredients to make. 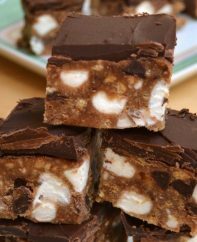 With May around the corner, they’re a delicious dessert idea for celebrating Cinco de Mayo too! The secret ingredient is these TortillaLand uncooked flour tortillas from Costco. They’re located in the refrigerated section at most locations (check here to see if your local store carries them). If you’re planning a party, these packages come in really handy. There are 50 tortillas in total, so you can use some for this recipe and the rest for appetizers or mains. Or you can freeze the second package for later. Did we say how easy these cups are to make? We’re talking about ready in 15 minutes you can make the yummy apple filling while the tortilla cups are baking. Then you simply put the filling into the baked cups, and top with optional whipped cream and caramel sauce. One of the things we love about them is there are no additives or preservatives – the only ingredients are flour, water, canola oil, salt and sugar. 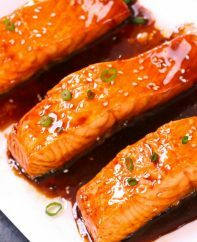 This recipe makes enough for 6 servings, although it’s easy to double, triple or even quadruple the recipe for a party. You’ll just need an extra muffin pan or two, along with some extra apples. Enjoy Cinco de Mayo or your next party! 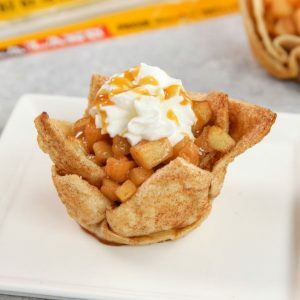 These Apple Pie Tortilla Cups are a delicious and easy dessert that only takes 15 minutes and 5 ingredients to make. With May around the corner, they're a delicious dessert idea for celebrating Cinco de Mayo too! Preheat oven to 400˚F. Set aside a 6-cup standard muffin tin. Place 3 tortillas on a work surface. Brush with melted butter and dust with cinnamon sugar. Stack and cut into quarters. 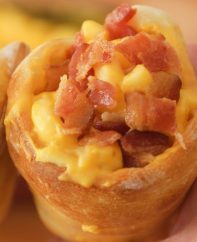 Place two pieces in each muffin cup per video. Bake about 8 min until golden and crisp. While they bake, make the filling. Mix the chopped apples with lemon juice and cinnamon sugar. Place frying pan over medium heat. Melt butter and sauté the apple mixture 3-5 minutes until soft. Remove cups from the oven. Cool slightly and add sautéed apple. Top with whipped cream and caramel sauce. Serve and enjoy! -To make cinnamon sugar, combine 2 tablespoons of white sugar with 1 teaspoon of ground cinnamon. 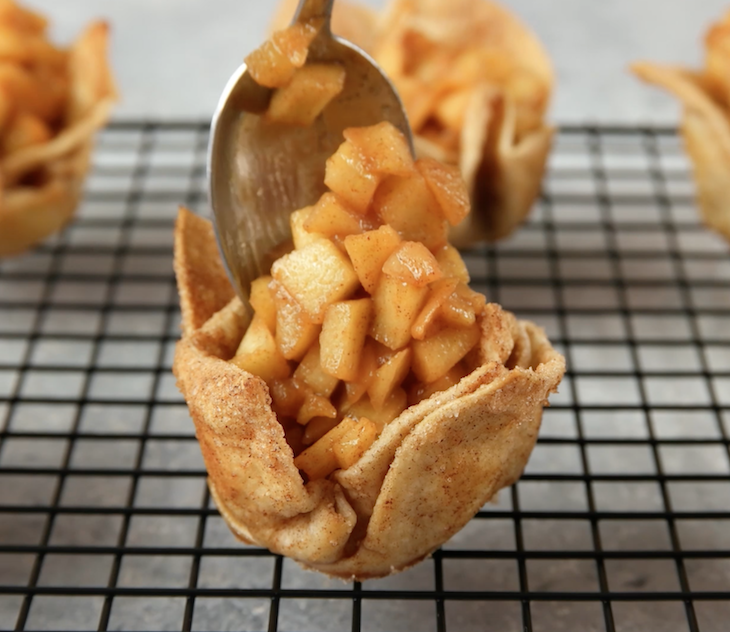 Looking for more recipes for mini apple pies?